1 L None No Power Seat 1 L is a standard First Class Bulkhead seat. 10 H None No Power Seat 10 H is a standard Business Class seat. 2 H None No Power Seat 2 H is a standard First Class seat. 20 A None No Power Seat 20 A is a standard Business Class seat whose proximity to the lavatories may be bothersome. 20 D None No Power Seat 20 D is a standard Business Class seat whose proximity to the lavatories may be bothersome. 20 H None No Power Seat 20 H is a standard Business Class seat whose proximity to the lavatories may be bothersome. 20 L None No Power Seat 20 L is a standard Business Class seat whose proximity to the lavatories may be bothersome. 31 D None No Power Seat 31 D is a standard Economy Class Bulkhead seat whose proximity to the lavatories may be bothersome. The tray table is in the armrest, making the armrest immovable and slightly reducing seat width. There is no floor storage for this seat during take-off or landing. 31 F None No Power Seat 31 F is a standard Economy Class Bulkhead seat whose proximity to the lavatories may be bothersome. The tray table is in the armrest, making the armrest immovable and slightly reducing seat width. There is no floor storage for this seat during take-off or landing. 31 G None No Power Seat 31 G is a standard Economy Class Bulkhead seat whose proximity to the lavatories may be bothersome. The tray table is in the armrest, making the armrest immovable and slightly reducing seat width. There is no floor storage for this seat during take-off or landing. 31 H None No Power Seat 31 H is a standard Economy Class Bulkhead seat whose proximity to the lavatories may be bothersome. The tray table is in the armrest, making the armrest immovable and slightly reducing seat width. There is no floor storage for this seat during take-off or landing. 32 A None No Power Seat 32 A is a standard Economy Class seat that has extra legroom due to the exit in front however, the close proximity to the lavatories may be bothersome. The tray table is in the armrest, making the armrest immovable and slightly reducing seat width. There is no floor storage for this seat during take-off and landing. 32 B None No Power Seat 32 B is a standard Economy Class seat that has extra legroom due to the exit in front however, the close proximity to the lavatories may be bothersome. The tray table is in the armrest, making the armrest immovable and slightly reducing seat width. There is no floor storage for this seat during take-off and landing. 32 C None No Power Seat 32 C is a standard Economy Class seat that has extra legroom due to the exit in front however, the close proximity to the lavatories may be bothersome. The tray table is in the armrest, making the armrest immovable and slightly reducing seat width. There is no floor storage for this seat during take-off and landing. 32 J None No Power Seat 32 J is a standard Economy Class seat that has extra legroom due to the exit in front however, the close proximity to the lavatories may be bothersome. The tray table is in the armrest, making the armrest immovable and slightly reducing seat width. There is no floor storage for this seat during take-off and landing. 32 K None No Power Seat 32 K is a standard Economy Class seat that has extra legroom due to the exit in front however, the close proximity to the lavatories may be bothersome. The tray table is in the armrest, making the armrest immovable and slightly reducing seat width. There is no floor storage for this seat during take-off and landing. 32 L None No Power Seat 32 L is a standard Economy Class seat that has extra legroom due to the exit in front however, the close proximity to the lavatories may be bothersome. The tray table is in the armrest, making the armrest immovable and slightly reducing seat width. There is no floor storage for this seat during take-off and landing. 44 A None No Power Seat 44 A is a standard Economy Class seat whose proximity to the lavatories and galleys may be bothersome. 44 B None No Power Seat 44 B is a standard Economy Class seat whose proximity to the lavatories and galleys may be bothersome. 44 C None No Power Seat 44 C is a standard Economy Class seat whose proximity to the lavatories and galleys may be bothersome. 44 D None No Power Seat 44 D is a standard Economy Class seat whose proximity to the lavatories and galleys may be bothersome. 44 F None No Power Seat 44 F is a standard Economy Class seat whose proximity to the lavatories and galleys may be bothersome. 44 G None No Power Seat 44 G is a standard Economy Class seat whose proximity to the lavatories and galleys may be bothersome. 44 H None No Power Seat 44 H is a standard Economy Class seat whose proximity to the lavatories and galleys may be bothersome. 44 J None No Power Seat 44 J is a standard Economy Class seat whose proximity to the lavatories and galleys may be bothersome. 44 K None No Power Seat 44 K is a standard Economy Class seat whose proximity to the lavatories and galleys may be bothersome. 44 L None No Power Seat 44 L is a standard Economy Class seat whose proximity to the lavatories and galleys may be bothersome. 6 A None No Power Seat 6 A is a standard Business Class Bulkhead seat. 6 D None No Power Seat 6 D is a standard Business Class Bulkhead seat. 6 H None No Power Seat 6 H is a standard Business Class Bulkhead seat. 6 L None No Power Seat 6 L is a standard Business Class Bulkhead seat. 61 A None No Power Seat 61 A is a standard Economy Class seat that has extra legroom due to the exit in front however, the close proximity to the lavatories and galleys may be bothersome. The tray table is in the armrest, making the armrest immovable and slightly reducing seat width. There is no floor storage for this seat during take-off and landing. 61 B None No Power Seat 61 B is a standard Economy Class seat that has extra legroom due to the exit in front however, the close proximity to the lavatories and galleys may be bothersome. The tray table is in the armrest, making the armrest immovable and slightly reducing seat width. There is no floor storage for this seat during take-off and landing. 61 C None No Power Seat 61 C is a standard Economy Class seat that has extra legroom due to the exit in front however, the close proximity to the lavatories and galleys may be bothersome. The tray table is in the armrest, making the armrest immovable and slightly reducing seat width. There is no floor storage for this seat during take-off and landing. 61 D None No Power Seat 61 D is a standard Economy Class Bulkhead seat whose proximity to the lavatories and galleys may be bothersome. The tray table is in the armrest, making the armrest immovable and slightly reducing seat width. There is no floor storage for this seat during take-off or landing. 61 F None No Power Seat 61 F is a standard Economy Class Bulkhead seat whose proximity to the lavatories and galleys may be bothersome. The tray table is in the armrest, making the armrest immovable and slightly reducing seat width. There is no floor storage for this seat during take-off or landing. 61 G None No Power Seat 61 G is a standard Economy Class Bulkhead seat whose proximity to the lavatories and galleys may be bothersome. The tray table is in the armrest, making the armrest immovable and slightly reducing seat width. There is no floor storage for this seat during take-off or landing. 61 H None No Power Seat 61 H is a standard Economy Class Bulkhead seat whose proximity to the lavatories and galleys may be bothersome. The tray table is in the armrest, making the armrest immovable and slightly reducing seat width. There is no floor storage for this seat during take-off or landing. 61 J None No Power Seat 61 J is a standard Economy Class seat that has extra legroom due to the exit in front however, the close proximity to the lavatories and galleys may be bothersome. The tray table is in the armrest, making the armrest immovable and slightly reducing seat width. There is no floor storage for this seat during take-off and landing. 61 K None No Power Seat 61 K is a standard Economy Class seat that has extra legroom due to the exit in front however, the close proximity to the lavatories and galleys may be bothersome. The tray table is in the armrest, making the armrest immovable and slightly reducing seat width. There is no floor storage for this seat during take-off and landing. 61 L None No Power Seat 61 L is a standard Economy Class seat that has extra legroom due to the exit in front however, the close proximity to the lavatories and galleys may be bothersome. The tray table is in the armrest, making the armrest immovable and slightly reducing seat width. There is no floor storage for this seat during take-off and landing. 69 J None No Power Seat 69 J is a standard Economy Class seat however, other flyers tend to bump into this seat. 7 A None No Power Seat 7 A is a standard Business Class seat whose proximity to the lavatories and galleys may be bothersome. 7 D None No Power Seat 7 D is a standard Business Class seat whose proximity to the lavatories and galleys may be bothersome. 7 H None No Power Seat 7 H is a standard Business Class seat whose proximity to the lavatories and galleys may be bothersome. 7 L None No Power Seat 7 L is a standard Business Class seat whose proximity to the lavatories and galleys may be bothersome. 72 L None No Power Seat 72 L is a standard Economy Class seat. 73 D None No Power Seat 73 D is a standard Economy Class seat in the last row of the aircraft whose proximity to the lavatory and galleys may be bothersome. 73 F None No Power Seat 73 F is a standard Economy Class seat in the last row of the aircraft whose proximity to the lavatory and galleys may be bothersome. 73 G None No Power Seat 73 G is a standard Economy Class seat in the last row of the aircraft whose proximity to the lavatory and galleys may be bothersome. 73 H None No Power Seat 73 H is a standard Economy Class seat in the last row of the aircraft whose proximity to the lavatory and galleys may be bothersome. 73 J None No Power Seat 73 J is a standard Economy Class seat in the last row of the aircraft whose proximity to the lavatory and galleys may be bothersome. 73 L None No Power Seat 73 L is a standard Economy Class seat in the last row of the aircraft whose proximity to the lavatory and galleys may be bothersome. 74 A None No Power Seat 74 A is a standard Economy Class seat in the last row of the aircraft whose proximity to the lavatory and galleys may be bothersome. 74 C None No Power Seat 74 C is a standard Economy Class seat in the last row of the aircraft whose proximity to the lavatory and galleys may be bothersome. 8 A None No Power Seat 8 A is a standard Business Class seat that is missing a window and whose proximity to the lavatories and galleys may be bothersome. 8 D None No Power Seat 8 D is a standard Business Class seat whose proximity to the lavatories and galleys may be bothersome. 8 H None No Power Seat 8 H is a standard Business Class seat whose proximity to the lavatories and galleys may be bothersome. 8 L None No Power Seat 8 L is a standard Business Class seat whose proximity to the lavatories and galleys may be bothersome. Each First, Business, and Economy Class seat has a personal TV with access to a wide variety of music channels. 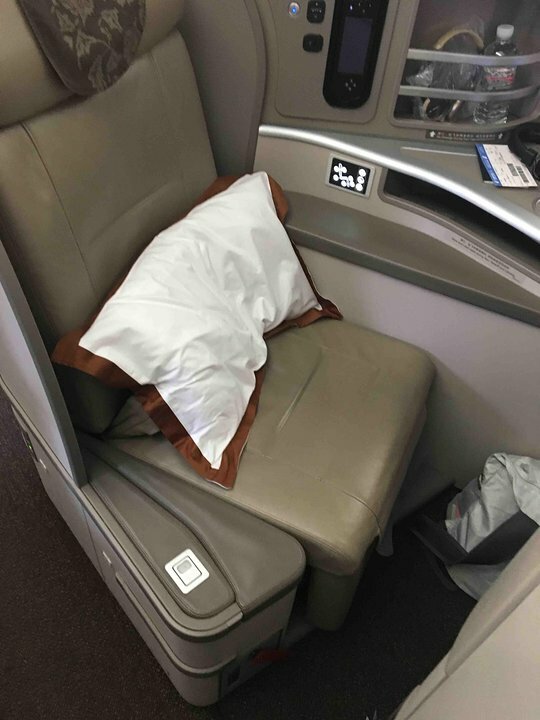 Each First Class seat has a 24" personal TV, each Business Class seat has a 16" personal TV and each Economy Class has a 11.1" TV that provides access to various Movies, TV programs, Games (including multiple 3D games), Electronic books, photo browsing using USB, and In-flight browsing and ordering of duty-free goods. All seats on this aircraft feature a personal AC power ports. Wi-Fi is available to all passngers in all classes aboard this aircraft. China Eastern serves complimentary meals, alcoholic beverages, and soft drinks. 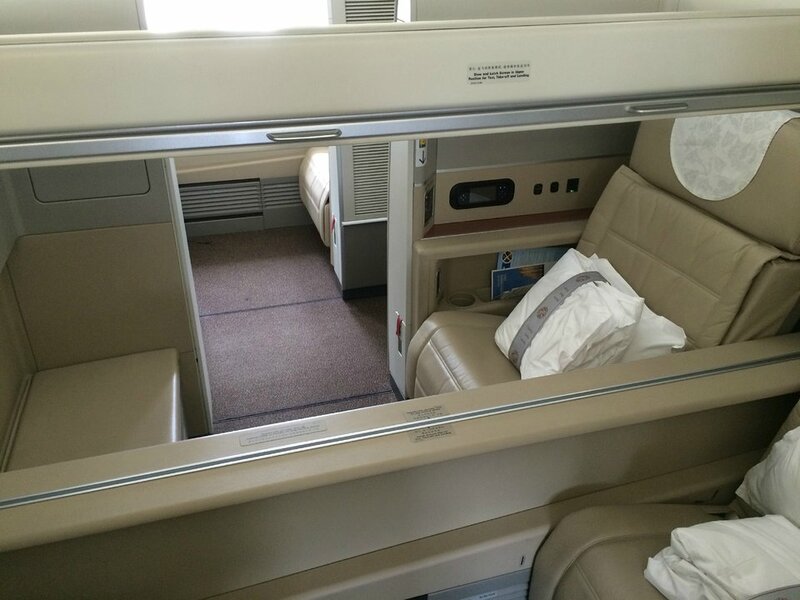 China Eastern's Boeing 777-300ER has a three class configuration with a total seating capacity 316 seats. The aircraft is outfitted with 6 First Class open suites, 52 flat bed Business Class seats, and 258 standard Economy seats. For the entire row 6, immediately in front of your seat is a decently sized flat countertop surface that is the height of your cubicle. This gives you some extra space to place items like your blanket and pillow. My seat was 32A This seat had amazing legroom and is super comfortable for long haul flights. What I don't like about this seat is that since you are closest to the door, it can get very cold as the air coming out of the door is very very cold. The middle seat is better or the aisle. I had no one beside me that's why I was able to try the others out. The proximity to the comfort room is very close which is a good thing. I don't mind the noise at all. All row D and H seats on these planes get hotter than the row A and L seats. Not as much airflow when traveling, I found myself sweating in the middle row, but when sitting on the outside rows this is a non-issue. Seats are frim, but do like the multifunction and that you can lay them in to a bed postion yourself - unlike Virgin where they have to "make" the bed for you. The new amenity kit does not include socks - but if you ask they will bring you a pair - Food was lacking, not tasteful at all (Western Choices), in fact the Western breakfast mushroom crepe was inedible. Entertainment options are limited. The seat is good, service and food can be upgraded. I traveled from LAX to PVG and have traveled with other airlines/planes business class previously. I thought the seat layout was awkward and the actual seat quite hard and uncomfortable. Even with the legs portion fully extended, the leg section didn't seem long enough (and I am short). I would look for another airline or another plane next time. Note: The service was absolutely fine, as was the cleanliness of the lavatory. Amazing extra legspace on both the window aisle and aisle seats especially when there's a 2-3-2 configuration so it's tilted and angled to work better for you! This is a very spacious seat with plenty of room to use your laptop comfortably. There is lots of usable space. Flight attendants were very nice, a little short on English but we could easily understand each other. Very quiet cabin since the flight attendants do not lug the carts around too often. The meals were decent, plenty to eat or drink. Dessert was also good. Good wine. No need to ask them twice for anything, they would always bring it within a few minutes. The bathrooms were kept fresh and clean all the time. This past September was my first time flying with Eastern and it will not be the last. And honestly, their price for business class was unbeatable. Seats 71D-H have about 10cm less leg room than all the other economy seats. And the flight attendant will try to claim otherwise. He even tried to make me pay extra for a seat next to the emergency exit when all 4 of them were free and when there were other unoccupied seats.. Luckily the (shorter) passenger 70H was willing to trade seats when I asked. They also had freezing cold air blasting in from somewhere, making a noise that eclipsed that of the engines. Everyone was covering up in their blankets and getting their jackets and extra blankets out of their carry-ons. I took a round trip from JFK to PVG. The crews were pretty and slim, far better than US airlines. Food is okay, ordinary service quality. Couldn't expect too much at such a low price. 70J is the first row that change from 3 seats one side into 2. I didn't feel any "extra room" for legs but really good to be farther from the person at your left side. Impossible for pass-bys bumping your seat. A relatively good seat for normal tier passenger. The seat room and the full flat bad is great, better than the Air france A380 business class. The amenities are ok, but the headphone is not ANC. The food is, but the chinees coke contains incredible hugh ammount of coffein (not possible to sleep after). The stewardess english was ok. General comment that I will use again, because the price of business class same as the price of economy on other teams. We booked on China Eastern to Manila because of a very attractive price. This 777-300ER was used on the long-hop ORD to PVO PVO to ORD. We requested 70A and 70C in both directions. This is the best economy seat for travelling couples as there is no DMS. The extra room next the window is good for my big frame and the extra room next to the aisle is nice to have room to stretch without blocking the aisle. Another benefit is no bumping of the elbow or knee every time someone walks by allowing for uninterrupted sleep. My wife was able to get a solid 6 hours on one stretch. I had to wake her up to go to the lav, which is close but far enough away so noise and odors don't offend. Engine noise is quite loud at take-off, and can be bothersome at cruise, but a good set of headphones will dampen the noise enough to sleep. Use those headphones with the great in-seat entertainment that has a good selection of Hollywood and Asian movies. China Eastern has a great Long-Haul Plane on their hands. If this review were only about this wonderful 777-300ER it would be glowing. Unfortunately it is staffed by the MOST UNFRIENDLY cabin crew in the sky. On all flights outbound and inbound, the flight attendants never cracked one smile toward a passenger. The requests to lower and raise the shades, close the tray table, buckle seatbelts were extremely terse "orders" barked as from a Drill Instructor, rather than customer focused flight attendants. (Not even Delta's old salts are this harsh!) No interaction we had with any cabin crew during the flight or Check-in/gate personnel resulted in a smile or warm response despite our many smiles and thank yous. The only smiles we received was when we boarded and deplaned, all of which seemed forced. Our usual choice for yearly travel home to the Philippines is Korean Air, whose service even in economy is IMHO world class and on par or exceeds CP, BA or ANA, and we regret not choosing them this time. Combine the horrible Cabin Crew, equally terse check-in/gate staff (even the internet customer service was poor) and the shuttle bus/air-stair boarding/deplaning and we will never fly China Eastern again, regardless of the price. I was content with seat 70L .. it is an aisle seat and at this point in the plane is a 2-4-2 configuration which means if you are bigger (as I am), you can spread out into the aisle a bit more without impinging on anyone else's space. 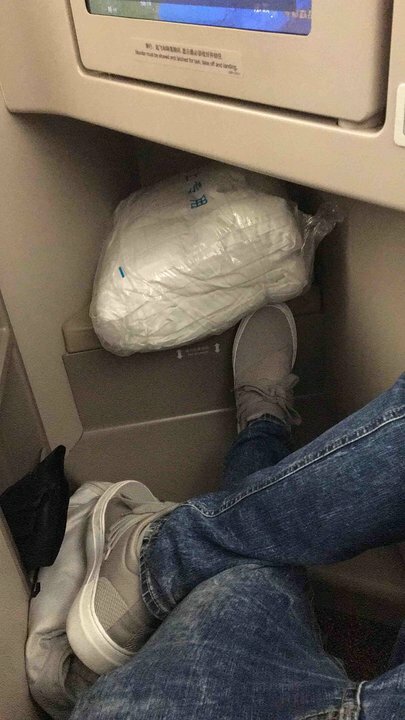 I flew business class from Toronto to Shanghai and wasn't looking forward to the Economy flight but it wasn't a bad experience at all. I actually enjoyed this seat. Both this seat and the one next to it (73L) had full recline. Having only one person next to you means you are only dealing with one person climbing over you to make trips to the bathroom instead of two. The line to the bathroom did reach my seat a couple times during the flight, primarily after meal services... it wasn't that bothersome. I just flew JFK-PVG in 11H and was very happy with the plane and the service. 1x2x1 seating eliminated need to step over anyone, and the middle 2 were angled in a way that each seat was very private. I was surprised at how much room there was when in the sleeping position. More room in the foot box than I have seen in many other configurations. Service was prompt and the food was good. I actually got a piece of beef that was not overdone! Will definitely fly them again. Plane was comfortable and generally tidy. This is new flagship non-stop service (2nd day) from ORD-PVG Shanghai. Seat 7D. Amenities ok- power strip, lighting, seat function and privacy good. Wi-Fi (advertised) did not work- staff did not know how to get around access issue. Staff friendly but generally very young and not attentive. Had call light on for 15 minutes post dinner service to get a cup of coffee, finally had to go to galley an ask. Flight 40% full in business class but they're not on top of offering water and checking on you periodically during the flight. On top of that- China Eastern lost my bag, spent 2 hours at Pudong trying to deal with their staff who again- speak very limited English, have a "system" that would be rivaled by only the pony express or two soup cans and a string. Nothing computerized, very chaotic, and I have no confidence that my bag will show up anytime soon. Their follow-up phone # on the form is inoperable so i'll have to see who I can contact when I get back to Shanghai after business meetings in Wuhan in 3 days. Meantime have to buy some clothes. Unfortunately- and I've been coming here since 1989, they've upgraded the hardware but the software and people skills are still just depolorable for an international logistics facility/country. Shameful that the backside (customer svc and professional approach) has been completely ignored. My second flight on China Eastern- will sadly likely be my last. I flew this plane from Fuzhou to Shanghai PVG (this plane continued to JFK but I was connecting on Delta's 777 to DTW). The plane is very new and clean. The main cabin seat, however, is very narrow made me feel very cramped on my elbow. It is due to the 3-4-3 configuration. In contrast, the main cabin seat on Delta's 3-3-3 config is noticeably wider and makes me feel less cramped. The legroom is OK though. My flight to PVG was only one-hour long, so the narrow seat did not make me feel uncomfortable. I could not imagine sitting on it for 13+ hours to JFK. Other than that, everything is new on this plane. The FA quickly served a bottle of water and a mini sandwich during the short domestic flight for 200+ people, very impressive. I would give the CEA as a whole picture a total of 8.5 rating. I wish the staff are given more training n seminars in terms of their accent and english knowledge. And from my understanding airlines whose flights gets delayed doesn't get any bonus, would be nice if this airlines get double bonus if NO DELAY. Every flight has a delayed. But overall experience is good and excellent service. I would fly again CEA. Seat 11D, Shanghai to JFK. From the few reviews on here, I'll admit that I had reservations about China Eastern. I can honestly say I'll gladly fly this airline again. I'm 6ft tall and about 240, and I found the seat to be very comfortable. The 1/2/1 arrangement worked well as nobody had to step over another passenger. The angle of the pods gave quite a bit of privacy. The level of service on this flight was wonderful. The all-Asian staff spoke sufficient English to meet my needs. I had western food for my early meal and Chinese for my later meal, and both selections were delicious. I did not use the bar service, but did ask for a soft drink a couple of times and they were happy to serve me. The entertainment was ok, decent selection of movies, thin selection of TV shows. My headphones were not working and they promptly replaced them. Honestly can't think of a single complaint about the flight, the staff or the airline. 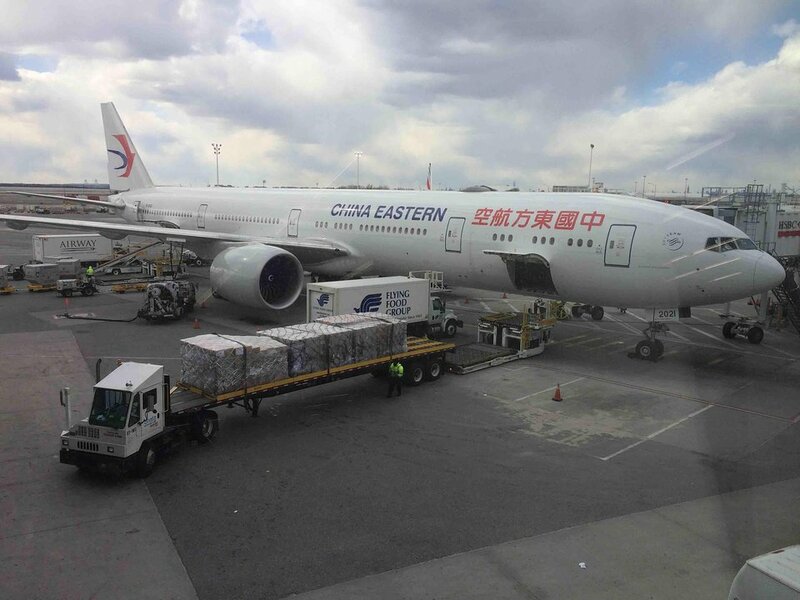 China Eastern flies 1 versions of Boeing 777-300ER.